As campaigns are looking to get their messages out, people are opting to receive those messages via text message. If political campaigns are not texting their audience, then they are already behind. There are many reason political campaigns use text messaging. This article will attempt to point out ten of those reasons and it also provides example texts for political candidates. The example texts for political candidates below will not only give campaigns a sense of how they could rephrase the example and use it for their own purpose, but they will also help nail in and show that text messages are an efficient, concise, and the best way to turn out your voters in 2018 and remain in touch with them after the election. If political text messaging is not done professionally with proper SMS etiquette, it can be met with mixed feelings, especially if it didn’t come across as genuine. There are right ways and wrong ways for political campaigns, staff, volunteers and donors to communicate via SMS. If a political campaign organizes well, they are already using SendHub to help them send and manage professional outbound, as well as inbound, text messages. 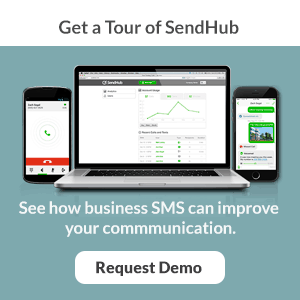 SendHub’s texting app makes most sense for political campaigns because it is a simple, out-of-the-box solution that is contract-free. Since email has about a 20% open rate and text messages have about a 90% open rate, winning campaigns are opting into SendHub. Campaigns that use texting as a communication medium know that the open rates are much higher. Open-rate is only one of the major reason political campaigns use text messaging. There are a number of reasons that text messaging is a legitimate and effective avenue for political campaigners to get their messages out. Here is a list of 10 of those reasons. Reminding people of not only the person to vote for but also the place and time to vote, as well as offering registration information, is a practical way to encourage voters to do their civic duty. Reminders may be used for timely purposes like events and meetings. They can also be used in the days or even hours leading up to voting time to encourage people to decide who they’re voting for, as well as plan some extra time on voting day. Since political campaigns are always counting down the days to the election with limited time remaining, these SMS reminders help keep all staff, donors, volunteers and supporters on track with the deadlines they’re supposed to meet – even if that’s just to show up to the polls! Example texts for political candidates reminders are provided below. New York Times article by one political operative, no one under the age of 45 wants a phone call. Ever since peer-to-peer (P2P) texting became commonplace in the 2016 election, mobile has been a popular method for getting the word out. And younger voters (aged 18-29) are almost entirely tapped into technology, so it’s crucial that campaigners use every tool in their wheelhouses to reach this key demographic. See more statistics about text messaging in this short youtube video. Political parties can use text messaging to solicit and gather donations. In addition, SMS can be used as part of a follow-up strategy for those who have chosen to donate via another channel. Check out this xxample texts for political candidates fundraising communication. [Insert first name], your generous donation helped us raise enough that we could buy pizzas for these cold and tired canvassers who knock doors for [insert candidate name] in [insert recipient’s neighborhood]. Did we mention open rate? Falling randomly at number four, this is probably the most important reason political campaigns use text messaging. For decades, campaigns contacted voters primarily by knocking on doors and by making phone calls. The Internet is a cluttered place, and many people don’t even notice invites to events. Facebook users can easily get mixed up between groups and pages and may not go the extra mile to check out a group’s event category on the page. A simple SMS message can help to move them in the right direction. Notify your volunteers of your next rally and get your message read fast! Average response rate of the text is 45%. Being that time is of the essence on a political campaign, you need to get your message read and often times you need a response! A good political field game listens to voters and collects information about who they’re supporting and what issues they value. SendHub allows political staff and volunteers to easily communicate with their base. Simply put, SMS texting is a simple, inexpensive, and direct method of reaching a massive amount of people with essential or urgent information. People appreciate a direct acknowledgment of their actions, especially if they’re doing gritty work like fundraising, even if it’s as simple as thanking people for the $5, etc. (Candidate) would like to extend a sincere “thank you” to all of their supporters and campaigners for the hard work they put forth this season. Even though we didn’t win this time, we’re still dedicated to helping (community) with (x, y, and z). Because of its succinct nature, SMS is the perfect way to direct meaningful campaign slogans to people on your lists. You may also choose to strategically incorporate slogans into engagement messages in order to help voters understand that you’re taking the slogan and its meaning seriously. SMS text messaging is an excellent method of sharing voting information, including registration information, to voters on your list. People appreciate a simple reminder and link for such things since sometimes instructions on voting materials sent in the mail or even online can be a little bit unclear. The people in charge of writing for a given campaign should have a grasp on the overall campaign message they are trying to convey to volunteers, donors and voters. The tricky part is developing concise, engaging and value-based messages. 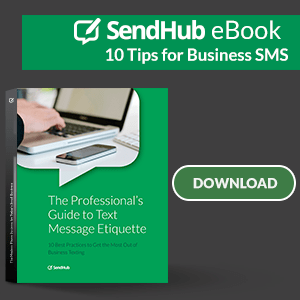 The simple part is typing that message into SendHub and efficiently getting that message out to your audience. Be sure to keep an eye on our SMS segment calculator. Persuasive writing taps into people’s emotions and pain points and then offers a solution. By acknowledging a topic that speaks close to the heart, rather than just saying “vote for this person,” you have a better chance of piquing their curiosity and encouraging them to follow the next steps without sounding pushy. You can think of it as framing a conversation based on mutual concerns or gently make them aware of a pressing issue or problem, rather than “telling” someone else who to vote for. Any And Every Event Reminder! Any And Every Thank You! “[Insert Name with SendHub’s MergeWiz], your generous donation helped us raise enough that we can take our campaign to [insert region]. Still looking to gain a new marketing perspective and try out different strategies in your next campaign? Want to learn more about how to tailor SMS messages towards voters in your political riding? Sign up for a demo today!